This is the place where Robby Takac feels the flutters: onstage, a few hours before a show, right around soundcheck, when the Goo Goo Dolls’ music tends to echo off the empty seats. It’s in moments like this, before the fans show up, where Takac’s nerves creep in. Man, Takac thinks to himself in moments of self doubt. I hope these people still care. They do. The logical side of him knows that. Yes, people still care. They care about the Goos, who released their 11th studio album, “Boxes,” in May and are in the midst of global tour that will take them to Europe and Asia over the next year. In Western New York, they care deeply about Takac, and not just for his celebrity status. Here, Takac is more. The West Seneca native is a dad, a businessman and a community leader. That latter role will be play out Sept. 10, when Music Is Art – the nonprofit he founded in 2003 – holds its annual daylong festival at Delaware Park. To get here, Takac will fly in on Friday from Houston, the morning after a Goos show. He’ll jet back to Texas on Sunday for a concert in Austin. But for one day – Saturday – Takac will be bouncing around Delaware Park, introducing bands, checking on logistics, meeting with sponsors, posing for photos, signing autographs. He’ll be doing that thing he is driven to do. He’ll be trying to make people happy. 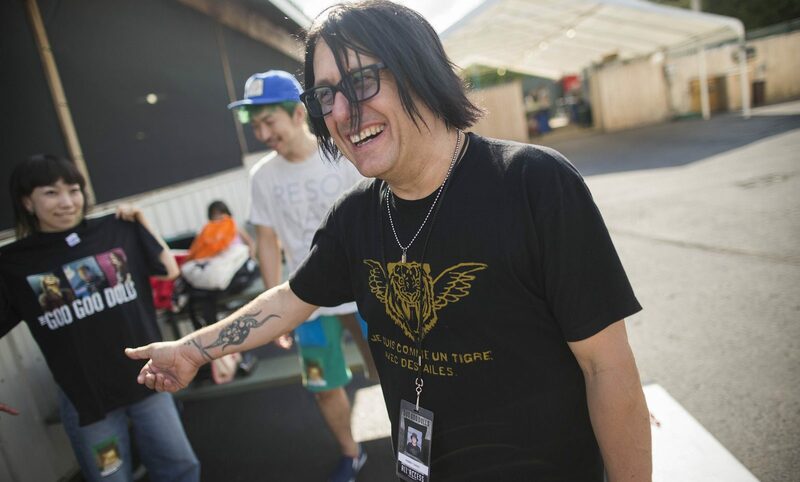 Takac, at 51, has been a professional musician for more than 30 years and a platinum-certified rock star for 20 of them. He still has the dark, shaggy face-framing hair. His preferred style in daily life – dark, silkscreened T-shirts, thick-rimmed glasses and a beanie – is a perfect fit, even in middle age. Onstage, he has no nerves. It doesn’t matter if he’s playing Darien Lake or the Olympics, on Jimmy Kimmel or in front of Billy Joel, in a volcano or an aircraft carrier, at the Pro Bowl or a corporate gig. (Yes, the Goos have done those all.) 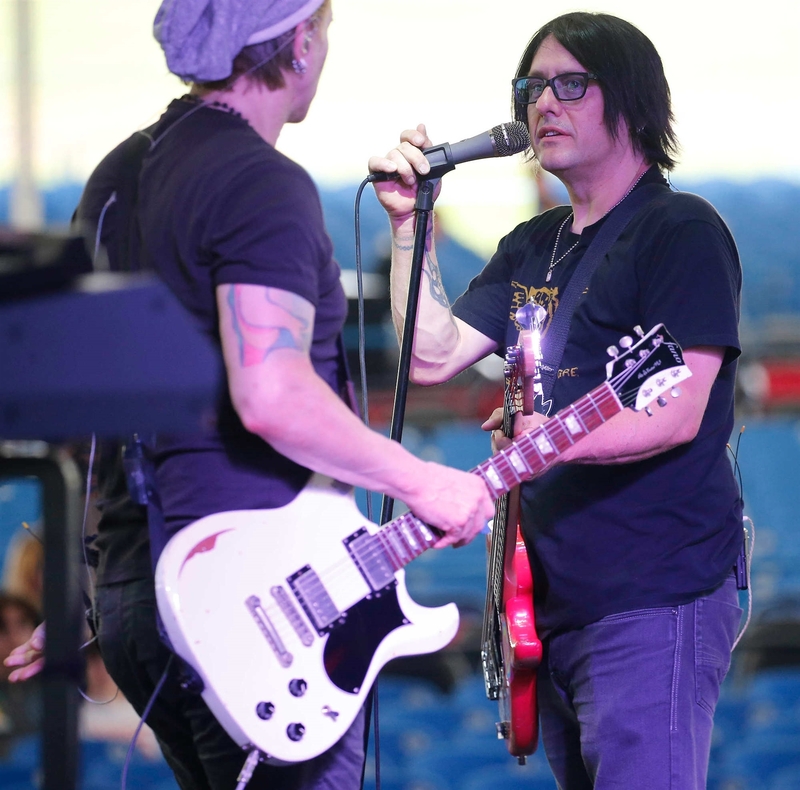 For Takac, co-founder of the band with lead singer John Rzeznik, a rock show is a haven. He’s right about the voice, and the body language that interlocks with it. Behind a microphone, working a crowd, he extends his limbs to full reach, arm overhead, elbow straight, fingers pointing to the lights above. His mouth and eyes widen into ovals. He’s transmitting a message – It’s time to party – and you’ll receive it before he says a word. But when he does say a word, you’ll hear it. Onstage, Takac’s gravelly tones billow into a scream, so much so that he’s come close to losing his voice on tour this summer. But outside of a show, Takac is a different guy. That gravel voice softens into sand. He’s subtler. When he sits on a couch, or on the corner of the floor in his recording studio lobby, he crosses his legs and tucks his feet beneath him. The I-can-do-that-better-than-anybody swagger slides into introspection, even a touch of self-doubt. There’s a lot of everything else: He’s got Music Is Art, which runs programs year-round for schools and young musicians. He’s a husband and dad: Takac lives downtown with his wife, Miyoko, and their 4-year-old daughter Hana. He’s an entrepreneur: Takac is the owner of GCR Audio, a Buffalo recording studio that he built with Rzeznik in 2008 at the Franklin Street site of the old Trackmaster studio. 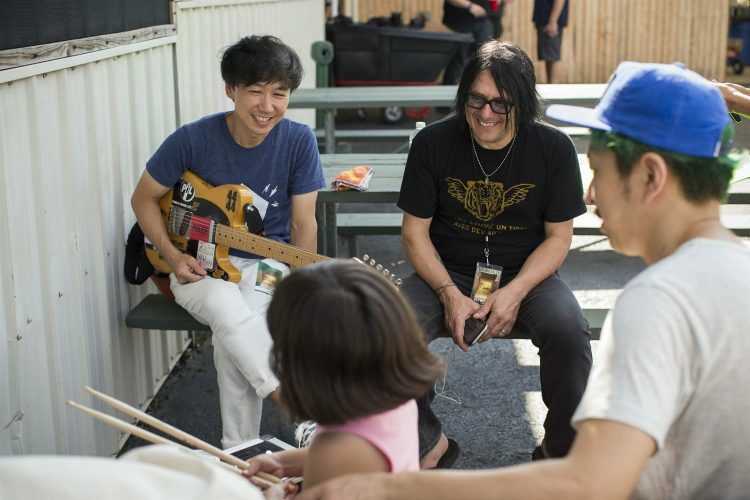 With his wife, who is from Japan, Takac runs the music label Good Charamel Records, which specializes in bringing Japanese rock bands to North America. Here at Goo Goo Buffalo shows, his worlds collide. Those guests include his parents and family, colleagues from the studio and Music Is Art, and many people who played a role in the Goos’ rise from a Buffalo punk band to a pop-rock act with instantly recognizable hits like “Iris,” “Slide” and “Broadway.” A group of teen musicians from Music is Art’s summer camp met with Takac and Rzeznik backstage and sat in on soundcheck. It’s highly intertwined world and Takac not only revels in it; he requires it. As the Goos became increasingly famous in the late ’90s – exploding with the release of “Iris” in 1998 – the members’ roles became more clearly defined. Rzeznik, as lead singer and songwriter, was – and is – the face of the band. Takac and then-drummer Mike Malinin, whom Takac and Rzeznik fired in 2013, were more in the background. “It feeds something inside of me that has been very valuable over the years,” Takac said. The payoff of the Goo Goo Dolls’ success is what allows him to do these things: He has the influence that comes with fame. He’s not fabulously wealthy, but he has the financial flexibility to run economically challenging enterprises like a recording studio and record label. Takac has developed a split-day routine on tour. (The Goos are in the midst of summer run that has them playing five or six nights a week.) His days usually start around 5 a.m., when the band’s tour bus typically arrives at the hotel in their city for the day. On a recent morning in Florida, with the Music is Art Festival drawing close, Takac was talking to his team about the production costs (“We’re severely over budget”), handling details for one of the 15 stages, doing interviews, and working on plans for a fall tour by one of Good Charamel’s Japanese bands, Shonen Knife. Takac’s day turns at 3 p.m., when he boards the tour bus for the venue. 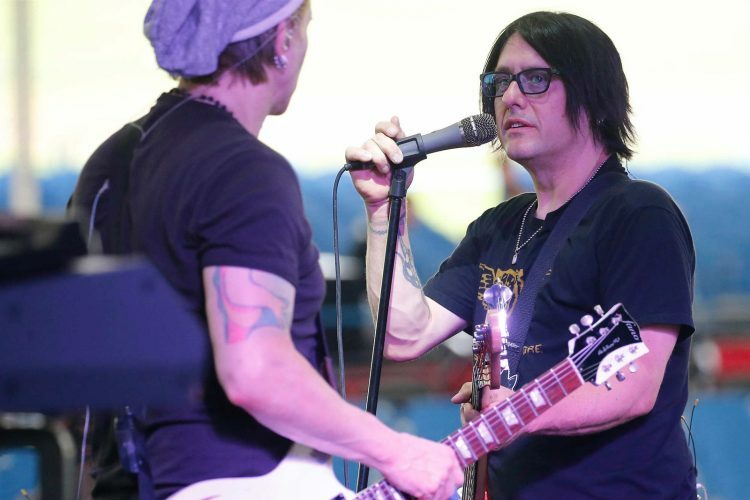 He’s entering what what he calls “Goo Goo Doll Land,” which runs nearly the same every night: Sound check around 4:30, meal at 5 o’clock, time off between 6 and 7, then a meet and greet with fans, a 90-minute show at 9:15 p.m., a quick post-show meet-and-greet, then onto the bus for a snack. Takac, who dropped 30 pounds recently on a juice cleanse, has given up eating pizza after shows. Instead he has three bowls of cereal: He starts healthy, with Crispix or bran, then mixes in some Lucky Charms for bowl number 2. The third helping – dessert – is Reese’s Puffs or Cocoa Krispies. Then he slips into his bunk to try to six solid hours of sleep heading into the next city, where he’ll repeat the two-sided day. From his close-up view, Rzeznik has seen Takac fight through business struggles, particularly with the Music Is Art Festival. It doesn’t always succeed as a fundraiser; last year, on a stormy, rainy day, it lost $40,000 last year and both Takac and his father pitched in to help fill the gap. Takac’s persistence is rooted in a pair of character traits that have paid off in all facets of his life: He likes dealing with people, and he wants to make people happy. Takac is a pleaser, but not a conformist. To the contrary, he wasn’t a good student at West Seneca, but his goals were clear. Robby set up a deejay booth in the basement of his parents’ home, where he spun records so loudly that the sound leaked through the walls and drew kids from around the neighborhood. He also became part of a morning radio club at West Seneca East. “I felt that kept him in school,” said Kathy Takac, who’s turned her son’s former basement bedroom into a makeshift Goo Goo Dolls archive, with awards and fans gifts adorning the walls and shelves. Takac was smart enough to graduate from both West Seneca and Medaille College, where he earned a communication degree and was on the dean’s list, without cracking down too hard on the studies. “Robby, never, in four years of college, opened a book,” Bob Takac said. Instead, Robby was spending time deejaying on the radio and making music with Rzeznik, whom he met through his cousin, and their original drummer, George Tutuska, who left the band in 1994. Even when he’s had the chance to stand out, Takac has typically opted to blend in with a team. For example, Bob Takac still talks about his son’s ability as a swimmer. When Robby was in seventh grade, he was a standout in the pool, even teaching kids much older how to swim. But he refused to compete. “He was with the band,” Kathy said, sitting next to her husband in the living room of the same house where they raised their children. At the same time, he’s candid about their relationship, which was tested to the core in recent years as Rzeznik struggled with alcoholism. Rzeznik stopped drinking two years ago. “We’ve been friends, enemies, frenemies, best buddies, confidants, and everything else that two dudes who’ve been having a relationship like this, unguided, for 30 years,” Takac said. In an interview for this story, Rzeznik brought up his own alcoholism in describing his relationship with Takac. One thing, actually, can be done. It’s something Takac did for Rzeznik. “He stuck around the whole time,” Rzeznik said. They have a new line of conversation, too, one that falls far outside of the Goo Goo Dolls Land they’ve built together: Rzeznik, who is 50, is about to become a father. His wife Melina is due in December. Sometimes when she’s playing with dolls, Hana will hold one of them up to her father and say, “She wants a picture with you,” because that’s a normal part of her daily life. People see her dad and they want something: a selfie, an autograph, a conversation, a favor. He may not it do it all. But Robby Takac – the rock star who looks to an empty audience and hopes people will be there, the little boy-turned-man who simply wanted (and wants) to connect with people and please them – sure will try. Full name: Robert Carl Takac Jr.
Family: Takac and his wife Miyoko have a 4-year-old daughter, Hana. Education: Takac is a graduate of West Seneca East High School (1982) and Medaille College (1986), where he earned a bachelor’s degree in communications. 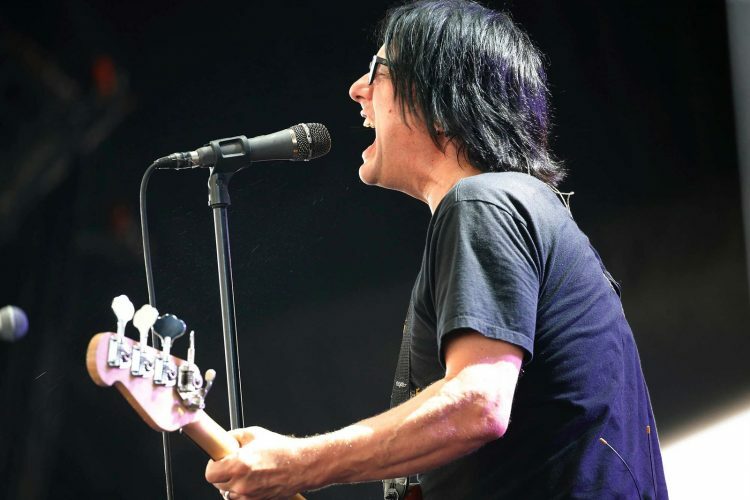 Musician: Takac is the bassist for the Goo Goo Dolls, which he founded in 1986 with lead singer and guitarist John Rzeznik and then-drummer George Tutuska. Takac was the band’s original lead singer and still sings lead on some songs today, but after their first album, Rzeznik moved into the front man position. Nonprofit leader: In 2003, Takac founded Music Is Art, a Buffalo-based, 501c3 operation that runs year-round programs for students interested in the arts. The organization is best known for its annual Music is Art Festival, an all-day affair happening this Saturday, Sept. 10 at Delaware Park. Originally, Takac (who had moved back to Buffalo from Los Angeles) and Rzeznik (who still lived in L.A.) were going to run the studio jointly. But Rzeznik decided to step back, and Takac took sole control of the studio, which now operates as GCR Audio. Label head: In 2003, Robby and Miyoko Takac started Good Charamel Records, which has evolved to focus on bringing Japanese “J-Rock” music to the United States. Among the label’s Japanese acts are Shonen Knife, Molice, Pinky Doodle Poodle and DJ Sashimi.